I frequently get asked how to make compost. It is really simple, but it seems everyone tries to make it complicated. Simply put, compost is decayed organic matter. Organic matter is plants and manure and even animals. Everything will decay eventually, but when we make compost we try to make this happen as quickly as possible. There are basically two components to compost, green and brown. Green things are things that are rich in nitrogen. Nitrogen is what smells when something decomposes. Nitrogen is also the fertilizer that we want to capture in the soil. Brown things are things that are rich in carbon. Carbon is what we use to bind to the nitrogen to capture the nitrogen in the soil. 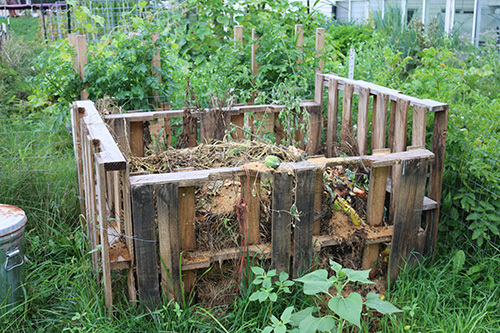 The basic rule is if your compost pile stinks, add more brown. If things are not getting hot, add more green. Hot? What do you mean, hot? When the chemical reaction happens that breaks down the organic matter it gets really hot. I have seen steam rising from my compost piles. This means that your compost is moving along quickly. Quickly is months instead of years. This isn't a process for the impatient. 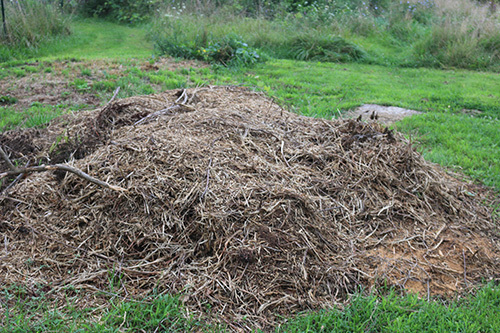 How do you make a compost pile? It is really just a stack of green and brown stuff. I muck out my barns, full of manure and urine soaked bedding. I will layer it with wood chips or leaves. I also add layers of kitchen waste and garden waste. I will add weeds, although weed seeds can survive the compost process if your pile doesn't get really hot. Some prefer to not add weeds for this reason. It really is just a pile of waste. The taller the pile, the hotter it will be able to get. You can build something to allow you to stack it high like a chicken wire hoop or pallets, but you can also just make a pile. There is one thing you can do to move the process along. The reaction requires oxygen to proceed quickly. The best way to infuse oxygen into the pile is to 'stir' it. That's hard to do, so it is best to turn the pile. You are basically stacking the pile in a new place, right next to the old pile. the stuff on the top ends up on the bottom and the bottom is now on top. That gets oxygen into the whole pile and gets it to react faster. If you don't want to spend the time turning the pile, it will just take longer. I usually leave my piles alone and they are ready for the garden in a year. That's it. You can make it complicated by trying to find exactly the perfect things to add to your pile, but really you can make good compost out of anything. I find it is better if you can find some animal manures, but it isn't necessary. If you are having problems with blossom end rot on your tomatoes, then you'll want to find some calcium sources to add like egg shells and bone meal. But really, the best fertilizer is the one you make out of what you have.